The aim of this tutorials is to learn, How to configure AEM Plugin in Eclipse and use aem server to sync code between aem instance and eclipse. Its easy integration with eclipse. Synchronization of both content and OSGI bundles. Hot swapping of code means no need to re build every time. Easy access to JCR properties. 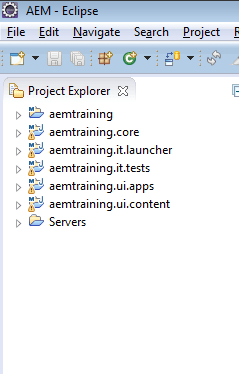 Currently AEM Developer Tool support is available for 5.6,6.0,6.1 and can be used with Eclipse Kepler and above. 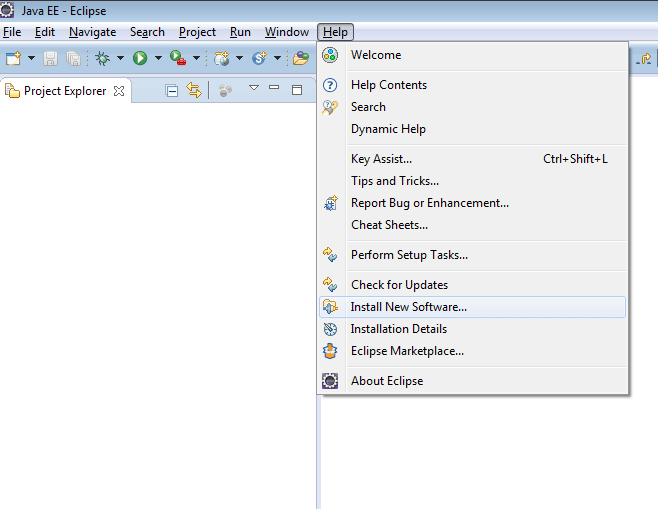 Click Add and Enter AEM developer tools plugin url http://eclipse.adobe.com/aem/dev-tools/ in Location Field and Click OK. Select both AEM and Sling Plugin and Click Next. Once installation completes it will prompt for restarting eclipse. Restart Eclipse. Note:- Warning pop up may occur as it is an unsigned software click OK on it. Go to Windows–> Perspective –> Open Perspective –> Other –> Select AEM. 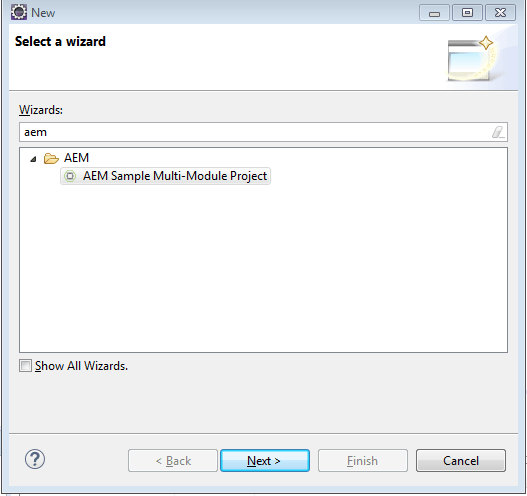 Go to File–> New –> Other –> Search for AEM and Select AEM Sample Multi-Module Project –> Click Next. 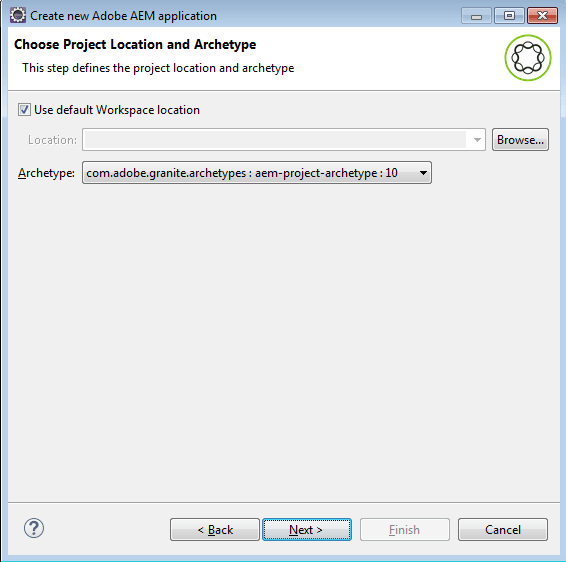 Choose project location and archetype. Select archetype 10 from drop down and click Next. Configure Arch Type Properties (Project related details) and Click Next. Create New server and Enter below details. Project should have above 5 modules. core, apps, content, tests and launcher. core: Java bundle containing all core functionality like OSGi services, listeners or schedulers, as well as component-related Java code such as servlets. ui.apps: contains the /apps (and /etc) parts of the project, i.e js & css clientlibs, components, templates, runmode specific configs as well as Hobbes-tests. ui.content: contains sample content using the components from the ui.apps. it.tests: Java bundle containing JUnit tests that are executed server-side. This bundle should not be deployed onto production. it.launcher: contains code that deploys the ui.tests bundle (and dependent bundles) to the server and triggers the remote JUnit execution. Right click on the Servers and Click on ‘Add and Remove‘. Add required modules on the server and Click ‘Finish’. Note:- Remember to exclude Test Module. If your project contains pom.xml errors. Might be maven source doesot downloaded properly. Right Click on Core –> Run as –> Maven generate sources. Sort bundles based on id , Apache Sling Tooling Support Install and Training-Core should come up. 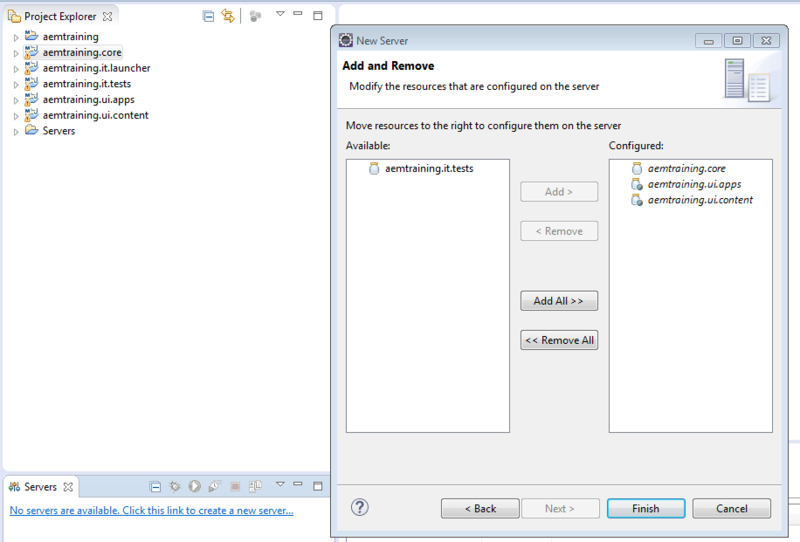 Double click on server –> From Add or remove server remove all modules and click Finish. Add all modules except test and Click Finish. 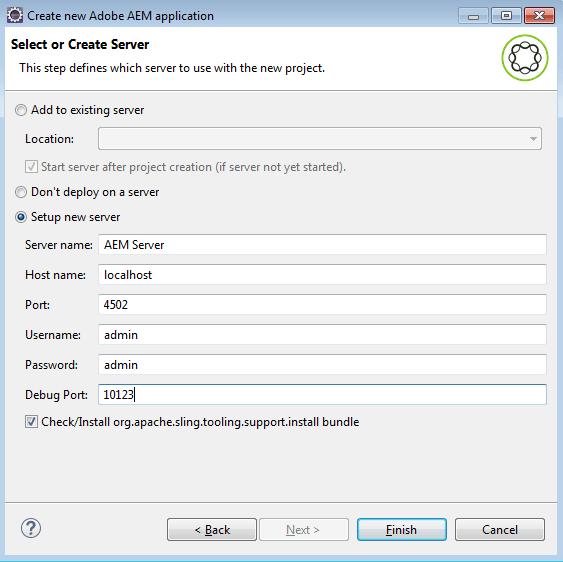 11 Responses to "Configure AEM Plugin for Eclipse"
i want to know how can i save a data like registration form please give me a link that i can understand it. I went through the process but when I am adding resources to my server I am unable to find all the resources . Only the bundle is visible where as the content and ui are not displayed to add. Could you help me figure out what went wrong ? The project is an old project and has not been created by eclipse rather created externally using mvn archetype but it should not be a concern !! Failed installing bundle: method execution returned status 500 . Did You find the solution for this ? This is a known bug, please raise a day care ticket. 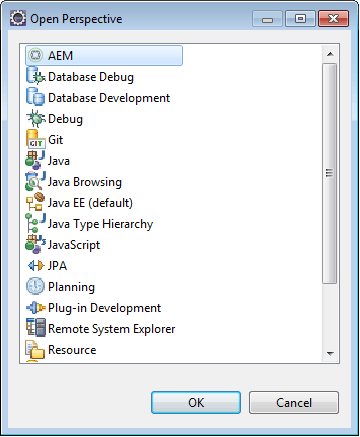 This is a handy blog – however i am unable to connect to my AEM 6.2 using Mars eclipse and AEM Sling plugin in “debug” mode. Could you possibly spend some time helping me on this? No suitable archetypes found. Please make sure that the proper maven repositories are configured and indexes are up to date. i am getting below error while creating aem project in eclipse ,could you please give me a solution. An internal error occurred during: “Updating Maven Project”. If anyone unable to download the plugin from eclipse? then using archive file also we will install the plug in . I am getting below error and dependencies are not downloading. I guess, It does not hot-swap code.